The DRS Protocol™ helps patients like yourself struggling with the pain and frustrations caused by spinal stenosis. Your spine protects your spinal cord and allows you to stand and bend. 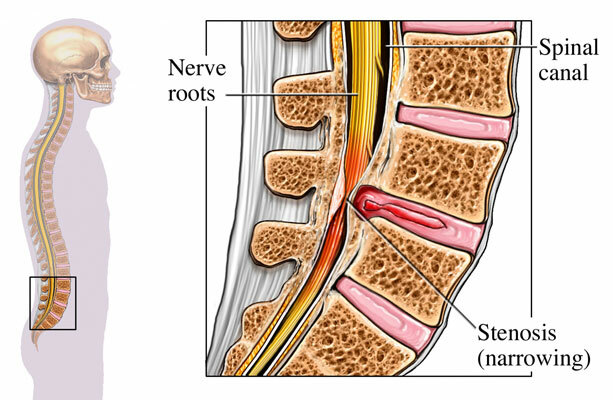 Spinal stenosis causes narrowing in your spine. The narrowing can occur at the center of your spine, in the canals branching off your spine and/or between the vertebrae, the bones of the spine. The narrowing may put pressure on your nerves and spinal cord, which may cause pain. One of the primary causes for stenosis is aging, and it is a common issue in patients over the age of 50. However, younger people with degenerative spinal conditions are also at risk. Diseases such as arthritis and scoliosis can cause spinal stenosis, too. Symptoms might appear gradually or not at all. They include pain in your neck or back, numbness, weakness or pain in your arms and legs, and foot problems. The wear-and-tear effects of aging can lead to narrowing of the spinal canal, a condition known as spinal stenosis. Narrowing of the lumbar spinal canal pinches the nerves that go to the skin and muscles of the legs. Sometimes, the pinched nerves become inflamed, causing pain in the buttocks and/or legs. Most often as a result of degeneration, there can be inflammation and swelling pushed into the soft tissue structures on the front and the back of the intervertebral canal. This can cause inflammation of the ligament on the back side of the spine. This, in conjunction with degeneration and minor disc bulges can cause a narrowing or the intervertebral canal also known as stenosis. Terri, diagnosed with stenosis, had tried conventional chiropractic care, but found the effects were temporary. Unable to watch the video for any reason? Prefer to read? Click here to view a transcript of Terri’s video. Learn about why you may be experiencing spinal stenosis below, and discover whether the DRS Protocol™ is the right treatment to help you finally experience true stenosis relief.